The Gambler's Fallacy goes by a lot of names. 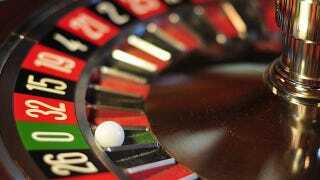 It's the Monte Carlo Fallacy, the Finite Supply Fallacy, or Fallacy of the Maturity of Chances. Whatever it's called, it loses people a lot of money. One time, it lost people millions of dollars in one night. The Gambler's Fallacy is the idea that past behavior influences future behavior. In everyday life, it's a good strategy — there are all kinds of ways that events in the past affect events in the future. When gamblers take that idea into a casino, things get very bad, very quickly. At least, things get bad for the people; the casino can wring some profit out of that cognitive bias, and it did at the Monte Carlo Casino on August 18th, 1913. It was an ordinary night, until someone noticed that the roulette ball had fallen on black for quite some time. When it just kept falling, people got interested. Then they started pushing money onto the table. The thought process was that the ball had fallen on black so many times that it had to fall on red sometime soon. Eventually, it did fall on red, but not until after 26 spins of the wheel, each of which saw a greater number of people pushing their chips over to red. The people who put money down on red for the 27th spin won money, of course, but even they lost much of their winnings because they believed that a long streak of black had to be followed by a long streak of red. Casinos are rife with people committing the Gambler's Fallacy, but we see it in everyday life as well. It's generally invoked when we deal with things that frighten us. People who fly a lot tend to think that, after so many flights, they're "working their way" towards a crash, even though every flight is independent of the last. People fall into the fallacy's clutches after lightning strikes and shark attacks, thinking that neither can happen in the same place twice. And, of course, if we notice we're on a lucky streak, or an unlucky one, it has to end soon or be balanced out by something good. If something — for example rainfall or temperature -—is below average for a season, people talk about it increasing soon to get the numbers up to average. We can't help thinking that, in all cases, the past explains the future. The problem isn't that we don't believe the numbers, it's that we put too much faith in math without understanding it. When we hear that a coin carries 50/50 odds, we expect those odds to be represented in the results of coin flips whether the coin is flipped four times or four thousand times or four million times. People unconsciously assume that the coin (or the die, or the roulette wheel) "knows" how many times it will be thrown during any given game, and obeys the law of averages. In practice, if we were to see a chart of four million flips of a fair coin, the overall ratio of heads and tails would be 50/50. If the chart were to extend to four billion, the ratio would get even closer to 50/50. The more flips, the more perfect the approximation of the odds. If, on the other hand, we were to zoom in on a few flips, we would see long streaks of heads and tails that don't make a difference in a collection of four billion flips but do mean you shouldn't count on 50/50 results after 26 games. This is the difference between the Gambler's Fallacy and the Casino's Reality. Casinos deal in thousands, or millions of throws, rolls, flips, spins, or pulls on a one-armed bandit. They can take the odds, and calculate the results of those odds fairly precisely. Gamblers, on the other hand, work with streaks of five, 10, 15 or 20. Even if the odds weren't stacked against them, there isn't any way to calculate the night's take with that. The fact that they try anyway only makes the casinos more money. Top Image: Ralf Roletschek - Fahrradtechnik und Fotografie. Poker Chip Image: Victor Vic.